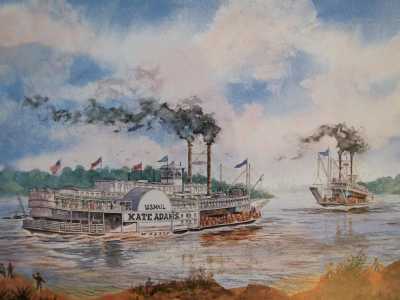 The first Kate Adams was launched in 1882 and reached Memphis on December 14th of that year. She was named after the wife of one of her owners, Capt. John D. Adams. She burned on Christmas Eve a year later at Commerce Landing with a loss of 33 lives. The second Kate was built and slid from her ways on March 15, 1889. For ten years she plied the river carrying passengers and freight. As a gesture of patriotism in the war of 1898 she was renamed the Dewey. The Kate Adams III was launched at Pittsburgh in 1898, 240 ft. long and a 40 ft. beam. She made her maiden trip in the Memphis-Arkansas trade Thanksgiving Day, 1899. Several years later her run was shortened and she plied between Memphis and Rosedale, Ms. In 1921 the run extended to Arkansas City and then Greenville. Tradition tells that a youngster in Sunday School being quizzed said that Adam was the first man and Kate Adams the first woman. A dear lady recalls she along with her brothers and sisters running to the bank of the great Mississippi to the sound of the sweet musical whistle of the Kate Adams. No other boat in the world had a sound like hers. There on the river was the gorgeous Kate Adams, sparkling in the sun a sight to behold. Even on cloudy days it seemed the whitest of white. There on the bank they stood, spellbound, watching the beautiful Steamboat ease down the river like a graceful swan. All prints, present and future are Authorized by the Estate of Marion Sue Thompson by Michael or Bridget Bradford. All prints are numbered and will include a “Certificate of Authenticity” which will be signed, numbered, and authorized by the estate. The sizes listed are Image Size. Add another 3 inches for total size of Giclee Paper Prints. The canvas prints are total dimensions. The estate holds the copyright to all paintings that go into print and all originals by Marion Sue Bradford and Marion Sue Thompson. More paintings and prints will be coming in the future. Our wish is for you to enjoy the work of Marion Sue Bradford Thompson for generations to come.